These Mini LED pucks can be recessed or surface mounted in any direction. LEDs consume less energy and run at a cooler temperature.These pucks are ideal for accent lighting inside, under or over any cabinet, shelf or display. Due to their very low profile, they are very easy to hide even in shallow structures. This Commercial Electric 3-Light LED puck light kit provide a quick and convenient way to brighten an area. The energy-efficient LEDs provide 60 lumens of soft white 3000K light for great illumination. The battery-operated lights have a slim design and offer different mounting options for versatile installation. The set includes three lights with batteries included. Making life simple for our customers is always an important priority for us. With a direct 120V driverless connection, we have accomplished our goal with our 120V metal LED pucks. The illume LED metal finish pucks are made of aluminum and are equiped with a frosted lens. Dimmable with most low-voltage electronic dimmers, they offer superior LED performance and lifespan. They can be used with a junction box (sold separately) and can be interconnected, up to a maximum of 20 puck lights. Ideal for built-in furnishings such as kitchen cabinets, china cabinets or trophy cases, it does not require power supplies. 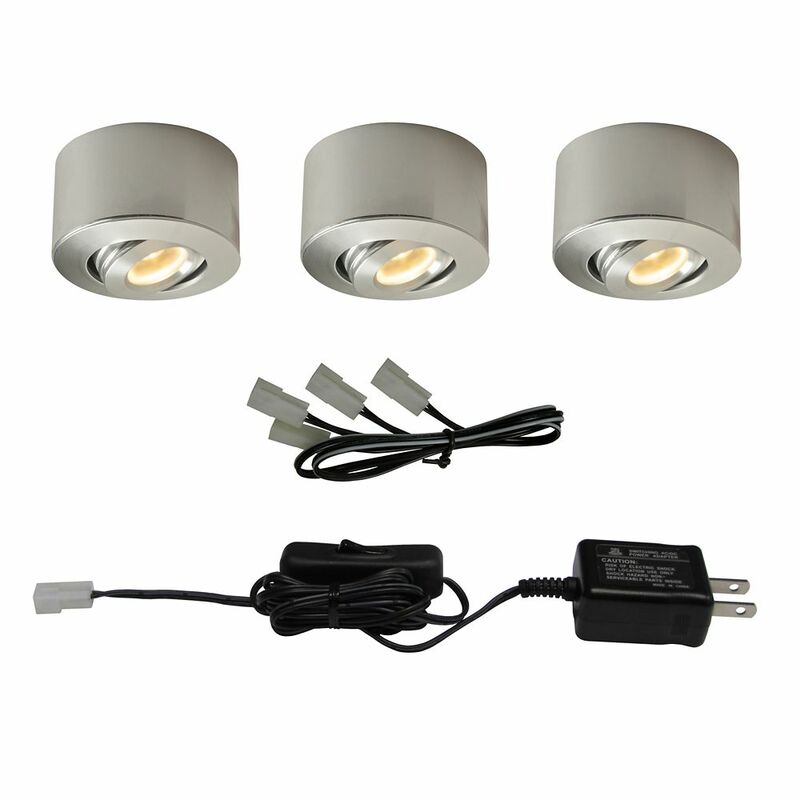 Kit of 3 Mini LED pucks These Mini LED pucks can be recessed or surface mounted in any direction. LEDs consume less energy and run at a cooler temperature.These pucks are ideal for accent lighting inside, under or over any cabinet, shelf or display. Due to their very low profile, they are very easy to hide even in shallow structures. Kit of 3 Mini LED pucks is rated 4.0 out of 5 by 1. Rated 4 out of 5 by James Knox from Good value It seems though these sets are the only ones available on the market. This set of 3 lights are NOT able to be connected to each other unless you splice them yourself, which I had to to! .....caution...6 led's per transformer! All in all, for my staircase application, the solution was positive, with a bit of ingenuity and creativeness. The manufacturer could supply a connector of sorts with a cautionary note of the maximum allowances for voltage, etc. All in all, the lighting effect which I was seeking was obtained and enjoyed!